Thank you! I think Drops Nepal is a good yarn to knit with, and after washing, it becomes quite squishy. Downside is that it´s non superwash, so it might not be suitable for every mom to be. But this mom knows how to treat woolens. I´ll have a look at the hats you mentioned! 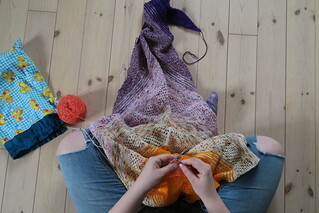 That´s quick and fun knits for sure! Thanks for the word on the Drops yarn..I know how to treat woolens too so will definitely try some!